In Philadelphia, the Smith Memorial Playground is a beacon. The space reverberates with tumultuous noise as kids high kick it into discovery mode. After more than a century, this place remains a play haven. However, the Smith oasis is not representative of play opportunities in public spaces throughout the city. Play Space, a partnership between the Community Design Collaborative and The Delaware Valley Association for the Education of Young Children (DVAEYC), is pumping up the volume on the play dialogue. The kidcentric project is active with local and international communities exploring modalities of play that go beyond standardized spaces. This is no off the shelf, prefab play solutions operation. 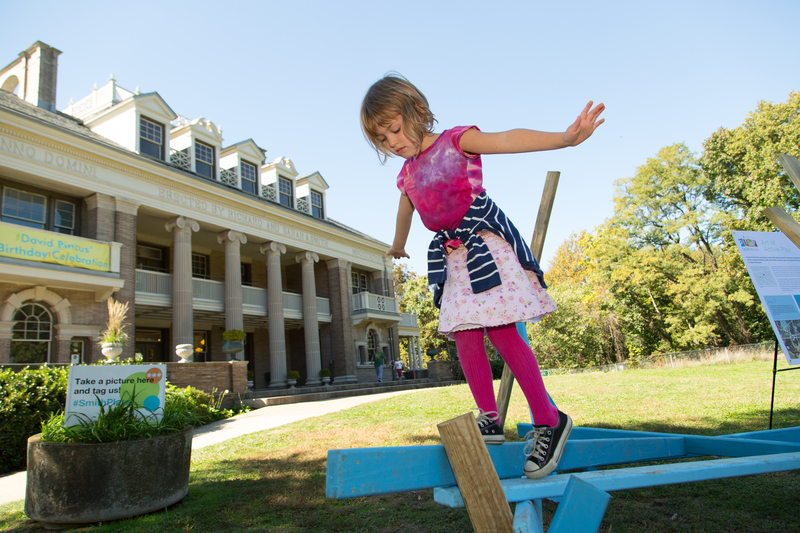 Play Space‘s 18-month horizon got underway this summer with architect Alexa Bosse leading the project. She’s a program associate with Community Design Collaborative as well as a landscape architectural designer, longtime community volunteer and mother of 3 1/2 year old twins. Alexa has no shortage of reasons to get active and up the ante for play in Philadelphia. We’re helping to bring the value of play to the forefront and underline how much it’s really needed especially in a city where many people don’t have access to a lot of outdoor space. 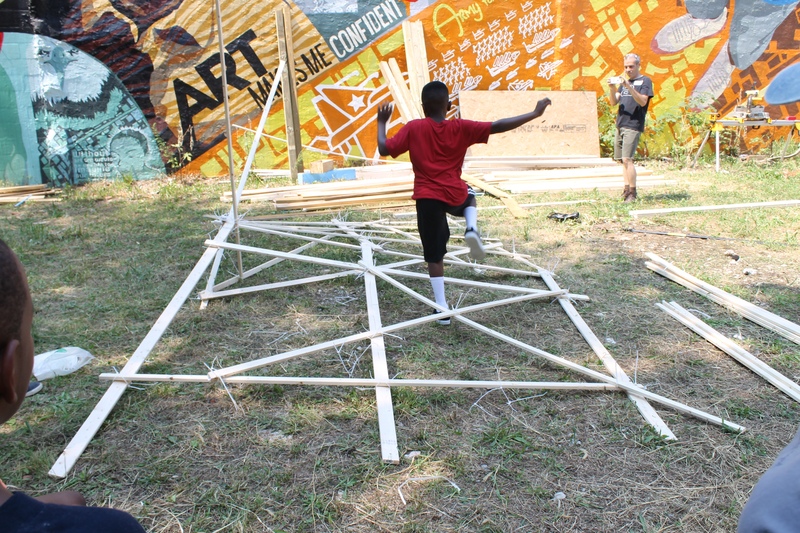 Play Space is part of Infill Philadelphia which engages innovative design in the revitalization of neighbourhoods. Over the course of the program there is a lecture series, a youth build with playable structures as well as work with educators and home-based child care centres. Accessible play makes for better communities and stronger families. Alexa is most enthusiastic about the design competition that will benefit three public agencies – a library, a school and the city’s parks and recreation branch. 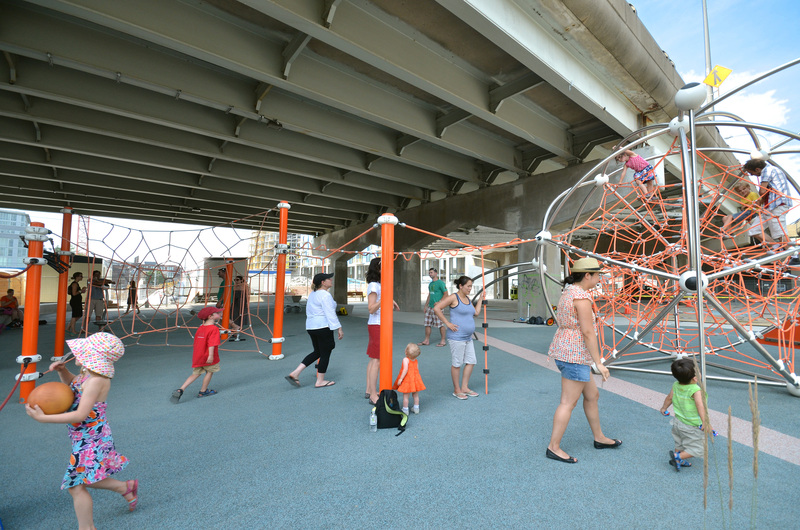 Although the USA has significant design restrictions, many associated with safety concerns, the dialogue that Play Space is leading is making inroads. With special friends like author Susan Solomon and filmmaker Erin Davis, who screened her documentary The Land, helping to spur the conversation, alternative visions of play spaces are gaining more currency. In fact, decision makers from the public agencies were initially very prescriptive in their directions. They have now relaxed the prescriptive directions in the interest of encouraging creativity and attracting a wide range of design teams to the competition. Alexa hopes that the result of this opening up will be finding a balance that emphasizes creativity and innovation while challenging people’s thinking about what a play space can be in an urban landscape. The best case scenario is that the design competition attracts models that can be replicated or adapted for other sites. My hope is that we’ll attract some international interest in the design competition. We’re so ready for it. All the information required to enter is here. Nota: one member of the team must be a licensed professional – architect, landscape architect, or engineer – in the country in which they are practicing. Although not a requirement, Play Space is encouraging multi-disciplinary teams that draw on the knowledge and experience of educators, parents, psychologists and others with a close connection to children. For Alexa, the Play Space objectives present a winning scenario for a city that is welcoming back millennials with young families. While we wait in anticipation for the results of the design competition, let’s turn the clock back to some images of Philadelphia play spaces from the 1950s and 60s. Click on the image below, or its cutline for a selection of vintage play sourced at the Philly History photo archives. Not all designs are created equal. This 1919 photo (click image to enlarge) from Halifax, Nova Scotia is a good illustration of the maxim. The ‘sling swing’ is an innovative design that didn’t have staying power, never became the standard. 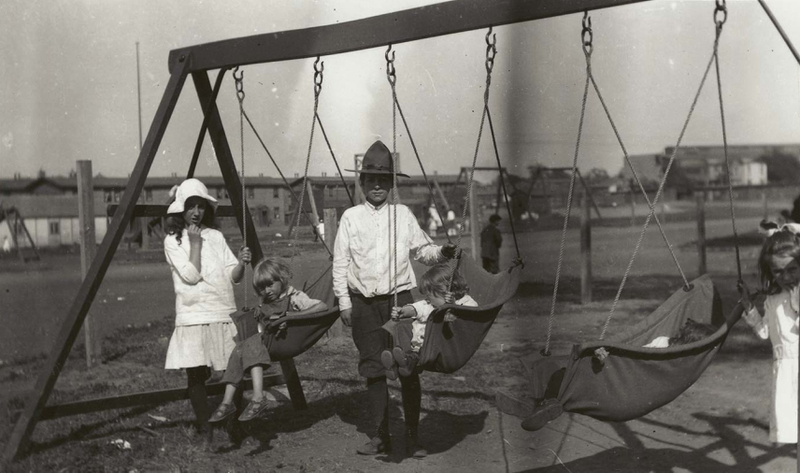 It was perhaps the precursor of the baby swing as we know it today. Note that it could be adjusted for sitting or reclining positions. Thanks to the Nova Scotia Archives for this brief blast from the past. Photo details – This photograph originally belonged to Jane B. Wisdom. This playground and the Central Playground on the Commons were equipped with money from the Massachusetts – Halifax Relief fund, the Rotary Club and other organizations. 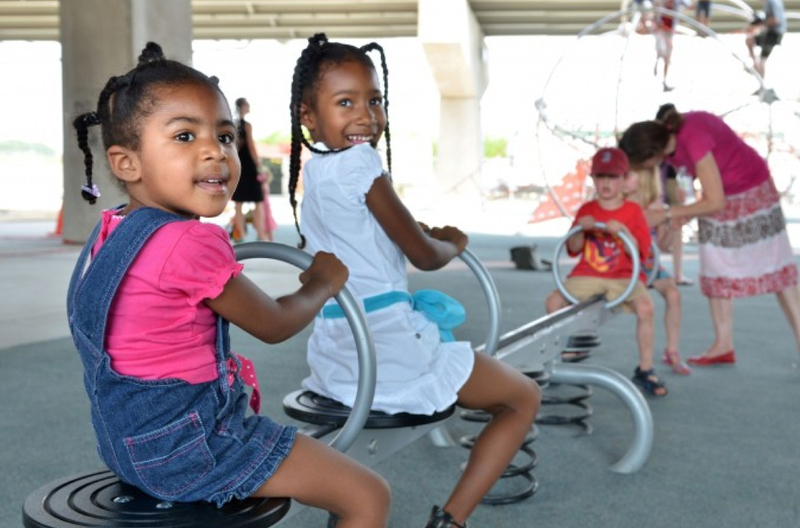 Nearly 500 cities now have public playgrounds and about half of them receive municipal support. In 257 cities last year over $2,500,000 was spent on 1,543 playgrounds, and 4,132 attendants were hired. “Providing play under intelligent direction,” was a primary motivator in the development of playgrounds as stated in the October 1913 issue of the magazine (see below). At the time, playgrounds were a relatively new phenomenon. The article comments on a governance shift moving responsibility for playgrounds from the oversight of private citizens to municipal governments. The same article also relates the story of a New Orleans fly swatting contest. Nearly 4.5 million flies were dispatched in a two week period by 32 boys. Had Guinness been around surely they would have had a record on their hands. 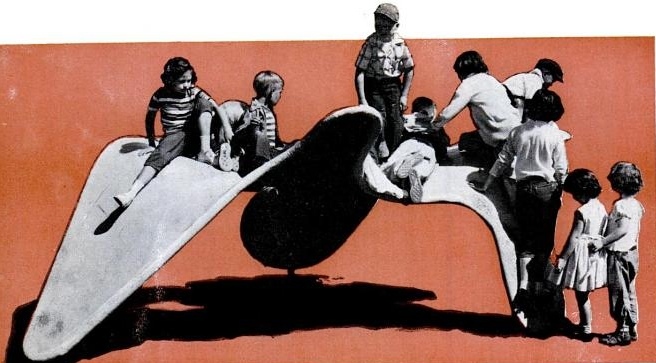 Over the ensuing decades, the publication continued to print articles on do-it-yourself playgrounds, innovative playground design, and the latest trends occasionally going beyond America’s shores in search of examples and stories. 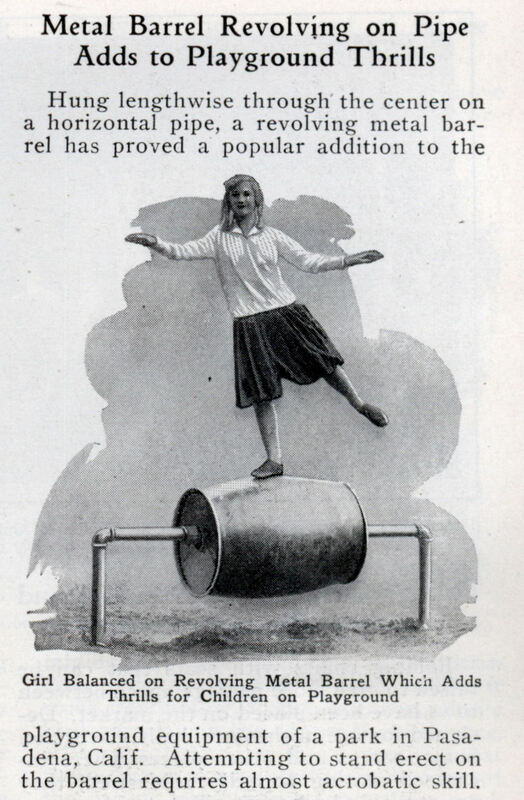 The October, 1924 issue featured a drawing of a revolving barrel worthy of inclusion in any lumberjack competition. It looks like a lot of fun but it’s not the type of equipment that would pass muster by today’s playground safety standards. In the early 1930s, the magazine offered a do-it-yourself article for a backyard playground with a kid-powered mini Ferris wheel, a roller coaster simulation and a treadmill. In spite of what looks to be a lot of fun on paper, none of these apparently had the staying power to become part of the conventional playground canon. 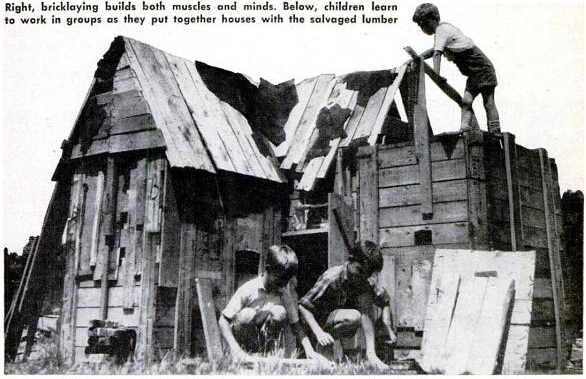 In their September 1953 issue, Popular Mechanics published a one-page item entitled Junk-Yard Playground. This photo taken in Copenhagen is an early example of an adventure playground. The concept of a space that is forever being tinkered with, a kinetic design and build studio for kids, went on to become popular in selected communities around the world. The build it approach fit right in with Popular Mechanic’s do-it-yourself focus. Currently, adventure playgrounds are relatively few in number and in some instances under threat but the passion of their supporters is legendary. A recent example of citizen engagement that saved one adventure playground from possible destruction is in Irvine, California. 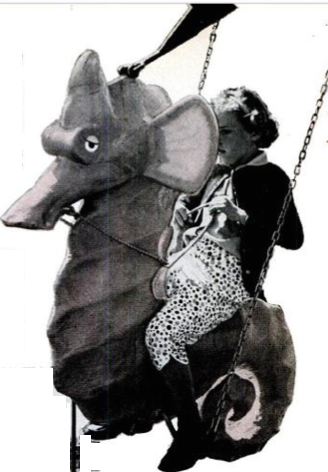 In 1956, the publication explored playgrounds with ‘imagination’. Primary examples of this new departure in playground design and equipment were drawn from California – specifically Oakland and San Francisco. It’s a time of experimentation, a time when designs embrace aesthetics and functionality. Rounding out this PM retrospective is the ‘taking the hurt out of play’ piece from the September 1963 issue. It’s all about safety and reducing the risk of injury. A half century of playground commentary starting nearly 100 years ago and many of the issues remain in play today. 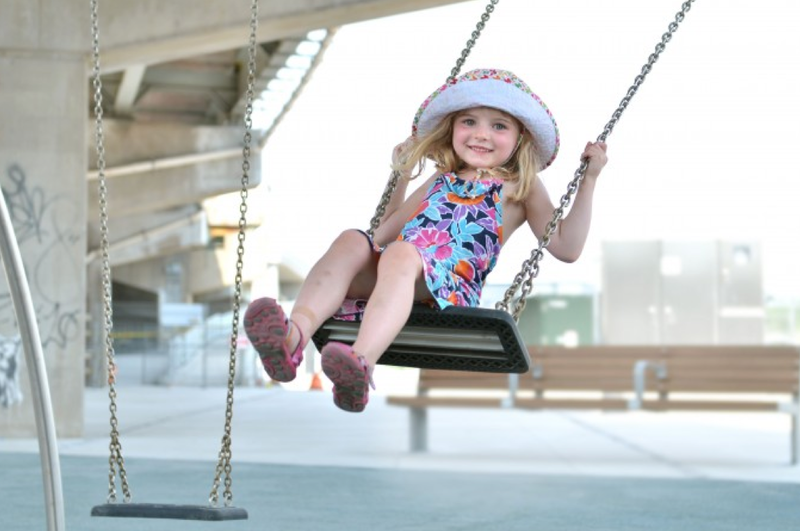 Around the world there is still inadequate space and resources being dedicated to playgrounds. Individuals, community groups and international organizations in North America and beyond are advocating to improve this situation. Design is ever evolving and will continue to bring to light new and imaginative structures and spaces. Witness this year’s inaugural Playable10 competition out of Atlanta. And of course there is the perennial debate around safety. There are a few more gems left from my Popular Mechanics archival searches. There are some other publications that have printed interesting playground articles over the years too. Stay tuned to read more about them in a future post. All images and all articles – Popular Mechanics.